When we think back to when the Olympics originated in 1896, the purpose was for all the countries to unite, to bring together the great talent, and to encourage each other to strive for greatness together.” In my eyes, that is pure beauty and what the Olympics are all about. Yet I feel sometimes we forget about that. There is no doubt that Michael Phelps winning 23 medals in his career is an astounding and unbelievable accomplishment. He should be rewarded and remembered for his ability, talent, passion and desire for winning, swimming, and achieving success. The Olympics is a very unique time that so many of us love and look forward to. Athletes devote four years to training and preparing for potentially one specific event and should be recognized for all of their hardwork, dedication and pride for what they do. That being said, this doesn’t mean that problems won’t arise, mistakes won’t occur, and injuries won’t happen. With these situations, no one knows when they are going to be confronted and no athlete ever wants to experience it, but when it does happen, the heartbreak and devastation is seen instantly. All in all, there is one thing that can be relatable between individuals, and that’s emotions. The beauty of what happened between Abbey D’Agostino and Nikki Hamblin really made me remember what ‘Competition’ truly meant. When we think of other times of competing, it wouldn’t surprise me if someone fell and we then see a competitor either step over them or just run around the athlete. By stopping or helping an opponent up, it would slow down her time, it would effect her pace and she would potentially become unfocused on the task at hand. Even though D’Agostino tore her ACL, meniscus and partial MCL, she still helped her opponent, Hamblin, up who eventually qualified for the next round. It is the times like these in the Olympics that should not be forgetten. 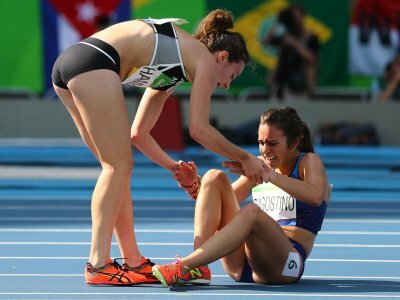 D’Agostino put aside the determined, fierce athlete she was during the race and instantly became a supportive, positive, honorable young woman. This was a moment where the two opponents were not competing against one another, but finally together. The Olympics were a great few weeks. Seeing all the records broken and all the unbelievable talent was unforgettable, but at the end of the day, sometimes it doesn’t always have to be about the number of medals you bring home to your country, yet more so about the experiences, friendships, and memories that were made.